Discussion in 'General Reptile Discussion' started by Edward87, Feb 12, 2019. I've seen threads about keeping carpet pythons together may not be a good idea, I just wanted to clear up is this an age thing as adults or are you able to keep younger pythons together for a while until they are a certain age? Its really your choice and truth is you might get away with it for many years. Im an advocate of the NO camp. Why, because the implications if this go wrong far outweigh any benefits. I can't even understand why you would want to. Snakes are not social animals, the only 'benefit' as such that I can think of is that you save a bit of cash and space for a 2nd enclosure. Is it really worth it??? Snapped and Edward87 like this. The cons outweigh the pros. Pet welfare should be considered over any "money saving"
Most of the vocal people will vehemently, often even viciously oppose keeping snakes together, but it is very common among the silent masses, and while there are sometimes problems, they're quite rare. The mishaps are recycled heavily and used as an example of why people who do it are terrible, evil people, and this is used to make other people feel better about themselves. I've never had a problem with it, although I haven't kept snakes together for some years now and generally won't do it again, although I do plan to have a large enclosure with live plants etc and several Chondros together in a display cage, and may do it with some others for some reason. Your snakes, your choice, but expect to get flamed if you talk about it online. 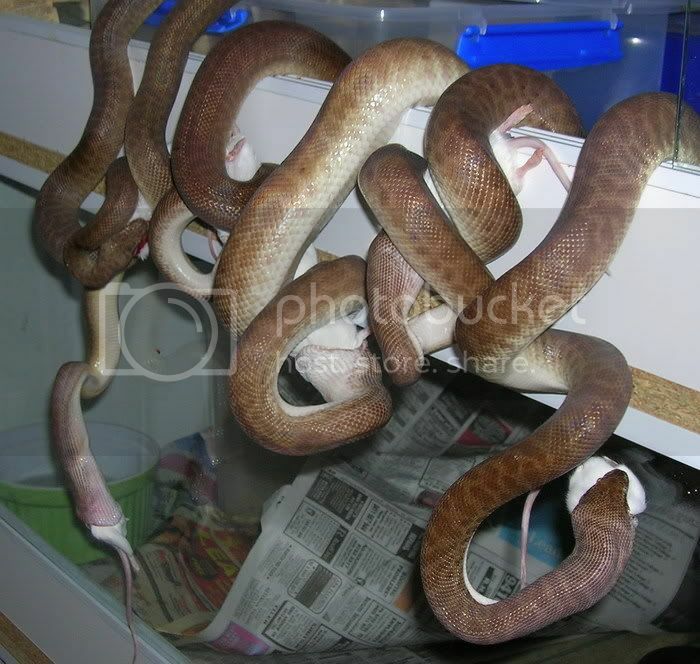 Here's an old picture of mine (over 10 years old now), these were snakes I'd bred for multiple generations and I kept together largely to troll the people who said it was oh-so-evil. They all got along well and I had good breeding success with them. Some of this blood is still in the my lines and lines my friends are working on after they were used as outcross snakes for morphs. Oh, and you seemed to think it was more of a problem when they're older. Generally speaking, it's more of a problem when they're younger. I've never had trouble when deliberately cohabbing snakes, but I have had cases of freshly hatched or born snakes eating siblings as their first meals before I've separated them into individual tubs. Older snakes which have settled into comfortable feeding routines on rats are generally good. Wild caught as adult snakes (something I've worked very little with and definitely would be reluctant to cohab) and juveniles are much more prone to having issues. Nice pic! Couldn't figure out what was I was looking at for a few seconds lolz it's good to hear both sides of keeping snakes together, yeah thought maybe the older they are the more territorial they would get, we're your enclosures alot bigger when housing two together? I've been keeping snakes for decades and love to experiment. I've tried all sorts of things, not just one case of keeping alone and one case of keeping together. But, you don't need much extra space per extra snake. Again though, I don't recommend cohabiting and it's generally nicer and easier not to, mainly at feeding time. Though, as my picture above shows, it's certainly quite possible. Then again... that was over 10 years ago and I'd had more experience keeping snakes before than than I have since then, and while I was comfortably able to do it, I'd expect most beginners would end up with trouble at feeding time if they attempted to cohab 6 pythons and feed them all together.